During April 2014, the Scripps Institution of Oceanography measured an average of 401.33 ppm CO2 concentration at their Mauna Loa, Hawai’i Observatory. This value is important because 401.33 ppm is the largest CO2 concentration value for any April in recorded history. This year’s April value is approximately 2.97 ppm higher than April 2013′s. Month-to-month differences typically range between 1 and 2 ppm. This particular year-to-year jump is outside of that range, but not extreme. For example, February 2012’s year-over-year change was +3.37 ppm and May 2012’s change was +3.02 ppm. Of course, the unending long-term trend toward higher concentrations with time, no matter the month or specific year-over-year value, as seen in the graphs below, is more significant. April 2014’s mean value of 401.33 ppm also represents the first time in contemporary history that a monthly mean exceed 400 ppm. The last time CO2 concentrations were this high was at least 800,000 years ago, and likely even longer – on the order of millions of years ago. The implications of this measurement are in some ways subtle and in some ways overt, as I discuss below. The yearly maximum monthly value normally occurs during May. 2013 was no different: the 399.89ppm mean concentration in May 2013 was the highest recorded value (neglecting proxy data) in 2013. May 2013′s record held until April of this year when the annual cycle pushed a monthly value above this record. Just like in years past, May 2014 is likely to set another new all-time monthly record (until February or March 2015 … you get the idea.) April 2014 is the first calendar month with mean CO2 concentrations above 400 ppm, but it won’t be the last. May 2014 will be the second. September 2015 will likely be one of the last months with mean concentrations below 400 ppm. After that, we probably won’t witness <400 ppm again. Figure 1 – Time series of CO2 concentrations measured at Scripp’s Mauna Loa Observatory in February from 1958 through 2014. Figure 2 – Monthly CO2 concentration values (red) from 2010 through 2014 (NOAA). Monthly CO2 concentration values with seasonal cycle removed (black). Note the yearly minimum observation occurred seven months ago (red curve) and the yearly maximum value occurred eleven months ago. CO2 concentrations will increase through May 2014, as they do every year, before falling again towards this year’s minimum value. Figure 3 – 50 year time series of CO2 concentrations at Mauna Loa Observatory (NOAA). The red curve represents the seasonal cycle based on monthly average values. The black curve represents the data with the seasonal cycle removed to show the long-term trend (as in Figure 2). This graph shows the relatively recent and ongoing increase in CO2 concentrations. The big deal is, as a greenhouse gas, CO2 increases radiative forcing toward the Earth, which over time increases the amount of energy in our climate system as heat. This excess and increasing heat has to go somewhere or do something within the climate system because the Earth can only emit so much long wave radiation every year. The extra heat added to the climate system during the past 150 years has almost exclusively gone into the ocean; during the past 15 years into the deep ocean (>700m). The latter is the result of low-frequency climate oscillations’ recent states (e.g., negative IPO phase). That process cannot and will not last forever. Within the next 5-15 years, those oscillations will switch phase and the excess energy will once again be more apparent near the Earth’s surface (where measurements are numerous and accurate). Meanwhile, the extra oceanic heat will continue to expand the ocean’s volume, which will further increase global mean sea level. That heat will also one day transfer to the atmosphere, causing further changes for land-based systems. CO2 concentrations are increasing at an increasing rate – not a good trend with respect to minimizing future warming. Natural systems are not equipped to remove CO2 emissions quickly from the atmosphere. Indeed, natural systems will take tens of thousands of years to remove the CO2 we emitted in the course of a couple short centuries. Moreover, human technologies do not yet exist that remove CO2 from any medium (air or water). They are not likely to exist at a large-scale for some time. 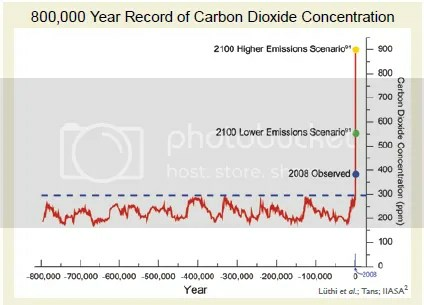 Therefore, the general CO2 concentration rise in the figures above will continue for many years, with effects lasting tens of thousands of years. Climate change as a result of increasing GHGs is affected cumulatively – that is, climate change effects we witness today are mostly a result of previous decades’ GHG concentrations, not today’s. Today’s concentrations will exert climate influence in future decades, not tomorrow. This lagged effect is one significant problem with climate action. Theoretically, if we could reduce CO2 emissions to zero today, today’s concentrations would cause further climate change for decades. All that said, the most obvious way to reduce additional future climate change is to reduce emissions. That requires either economic contraction or decarbonization (reducing the amount of carbon emitted per unit of economic output). Since we don’t want the former to happen, we have to focus on the latter. What does that entail? That entails directing public money to widespread science and technology research, development, and deployment. That entails innovators trying thousands of ideas so that we implement a few successes that are really efficient. Not every attempt will succeed – indeed, most will fail. We have to find out what doesn’t work as part of the process to find out what does work. That entails a sustained commitment to such efforts. This won’t happen with three years’ funding. It will happen with thirty and three hundred years funding. The California-related reports I mentioned yesterday (and will write about) demonstrate just how challenging the task is. Those challenges relate to opportunities, which is exactly how we have to frame them in order to get people to support them. As I often write, CO2 emissions and later concentrations will decline when we as a society want them to. Categories: environment, global warming, NOAA, policy, science | Tags: 350ppm, 390ppm, 400ppm, carbon emissions, climate policy, CO2 concentrations, emissions targets, Mauna Loa Observatory, public policy, Scripps | Permalink. During February 2014, the Scripps Institution of Oceanography measured an average of 398.03 ppm CO2 concentration at their Mauna Loa, Hawai’i Observatory. This value is important because 398.03 ppm is the largest CO2 concentration value for any February in recorded history. This year’s February value is approximately 1.23 ppm higher than February 2014′s. Month-to-month differences typically range between 1 and 2 ppm. This particular year-to-year jump is within that range, albeit smaller than some other recent months. For example, February 2012’s year-over-year change was +3.37 ppm and May 2012’s change was +3.02 ppm. Of course, the unending long-term trend toward higher concentrations with time, no matter the month or specific year-over-year value, as seen in the graphs below, is more significant. Figure 1 – Time series of CO2 concentrations measured at Scripp’s Mauna Loa Observatory in February from 1959 through 2014. 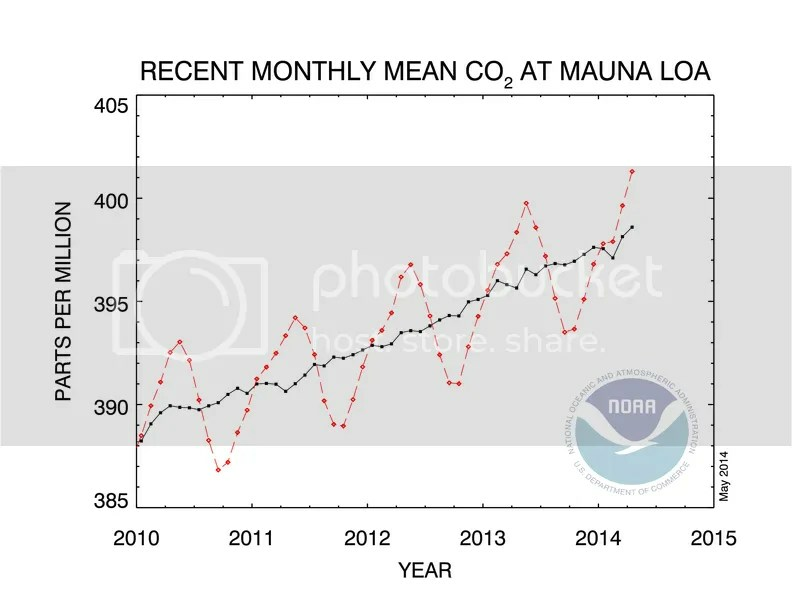 Figure 2 – Monthly CO2 concentration values (red) from 2010 through 2014 (NOAA). Monthly CO2 concentration values with seasonal cycle removed (black). Note the yearly minimum observation occurred five months ago (red curve) and the yearly maximum value occurred nine months ago. CO2 concentrations will increase through May 2014, as they do every year, before falling again towards this year’s minimum value. The big deal is, as a greenhouse gas, CO2 increases the radiative forcing toward the Earth, which over time increases the amount of energy in our climate system as heat. This excess and increasing heat has to go somewhere or do something within the climate system because the Earth can only emit so much long wave radiation every year. The extra heat added to the climate system within the past 15 years has almost exclusively gone into the deep ocean. This is the result of low-frequency climate oscillations’ recent states. That process cannot and will not last forever. Within the next 5-15 years, those oscillations will switch phase and the excess energy will be more apparent near the Earth’s surface. Meanwhile, the extra oceanic heat will continue to expand the ocean’s volume, which will further increase global mean sea level. The rise in CO2 concentrations will slow down, stop, and reverse when we decide it will. Doing so depends primarily on the rate at which we emit CO2 into the atmosphere and secondarily how effective CO2 removal in the future is. We can choose 400 ppm or 450 ppm or almost any other target (realistically, 350 ppm seems out of reach within the next couple hundred years). Our concentration target value choice is dependent on the type of policies we decide to implement. It is our current policy to burn fossil fuels because we think doing so is cheap, although current practices are massively inefficient and done without proper market signals. We will widely deploy clean sources of energy when they are cheap; we control that timing. We will remove CO2 from the atmosphere if we have cheap and effective technologies and mechanisms to do so, which we also control to some degree. These future trends depend on today’s innovation and investment in research, development, and deployment. Today’s carbon markets are not the correct mechanism, as they are aptly demonstrating. But the bottom line remains: We will limit future warming and climate effects when we choose to do so. 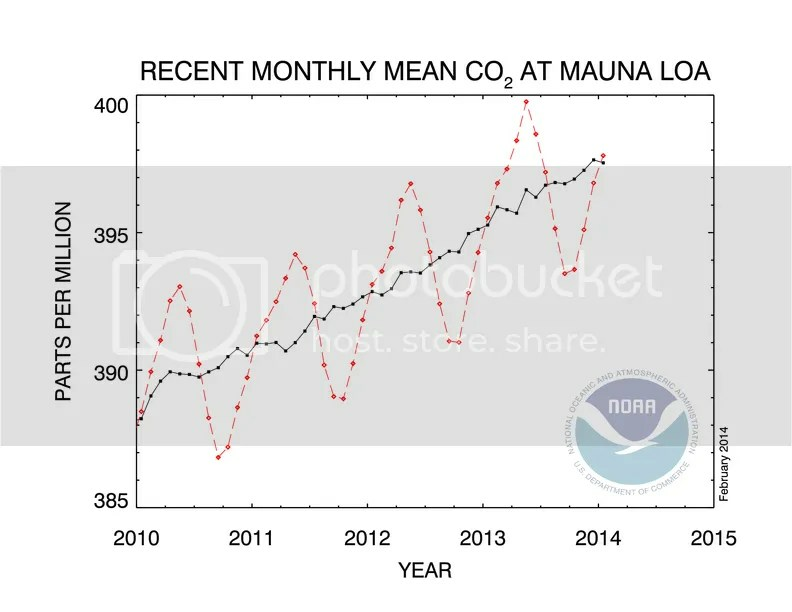 During January 2014, the Scripps Institution of Oceanography measured an average of 397.80 ppm CO2 concentration at their Mauna Loa, Hawai’i Observatory. This value is important because 397.80 ppm is the largest CO2 concentration value for any January in recorded history. This year’s January value is approximately 2.34 ppm higher than January 2013′s. Month-to-month differences typically range between 1 and 2 ppm. This particular year-to-year jump is just outside of that range, but is smaller than some other recent months. For example, February 2012’s year-over-year change was +3.37 ppm and May 2012’s change was +3.02 ppm. Of course, the unending long-term trend toward higher concentrations with time, no matter the month or specific year-over-year value, as seen in the graphs below, is more significant. Figure 1 – Time series of CO2 concentrations measured at Scripp’s Mauna Loa Observatory in January from 1959 through 2014. Figure 2 – Monthly CO2 concentration values (red) from 2010 through 2014 (NOAA). Monthly CO2 concentration values with seasonal cycle removed (black). Note the yearly minimum observation occurred four months ago (red curve) and the yearly maximum value occurred eight months ago. CO2 concentrations will increase through May 2014, as they do every year, before falling again towards this year’s minimum value. Figure 4 – Historical CO2 concentrations from ice core proxies (blue and green curves) and direct observations made at Mauna Loa, Hawai’i (red curve). This longer time series demonstrates how the curves in Figures 1 and 2 look when viewed against 10,000 additional years’ data. Clearly, concentrations are significantly higher today than they were for thousands of years in the past. While never completely static, the climate system our species evolved in was relatively stable in this time period. You can see this by the relatively small changes in concentration over many hundreds of years. Recent concentrations are an obvious aberration to recent history. Figure 5 – Historical record of CO2 concentrations from ice core proxy data (red), 2008 observed CO2 concentration value (blue circle), and 2 potential future concentration values resulting from lower (green circle) and higher (yellow circle) emissions scenarios used in the IPCC’s AR4. Note that this graph includes values from the past 800,000 years, 2008 observed values (12ppm less than this year’s average value will be) as well as the projected concentrations for 2100 derived from a lower emissions and higher emissions scenarios used by the 2007 IPCC Fourth Assessment report. It is clear that our planet’s climate existed within a range of CO2 concentrations between 200 and 300 ppm over the past 800,000 years. Indeed, you would have go back millions of years into the geologic history of the planet to find the last time CO2 concentrations were near 400 ppm. And let me be clear, the global climate then was much different from today: the globe was much warmer, there were no polar ice caps, and ecosystems were radically different from today’s. That’s not to say today’s climate is “better” or “worse” than a paleoclimate. It is to say that today’s ecosystems do not exist in the climate humans are forcing on the planet. If our current emissions rate continues unabated, it looks like a tripling of average pre-industrial (prior to 1850) concentrations will be our future reality: 278ppm * 3 = 834ppm. This graph also clearly shows how significant projected emission pathways could be when we compare them to the past 800,000 years. It is important to realize that we are currently on the higher emissions pathway (towards 800+ppm; yellow dot), not the lower emissions pathway. 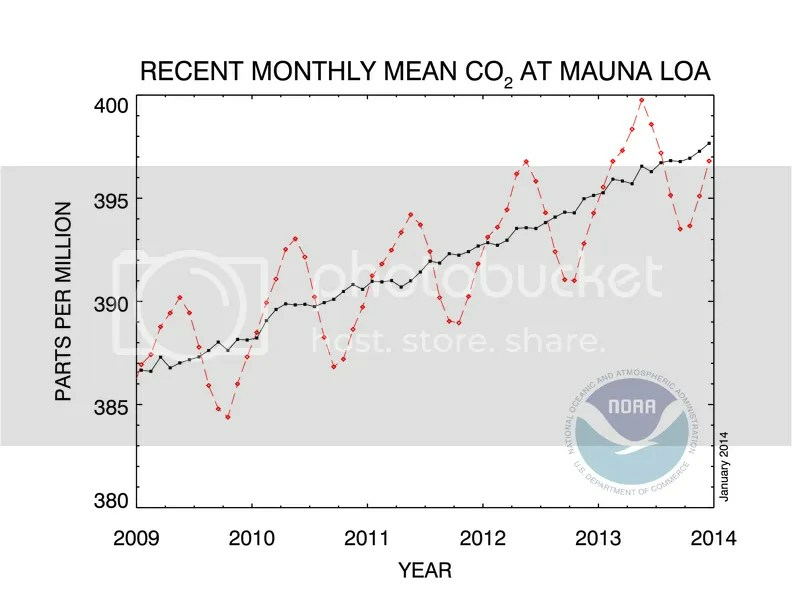 During December 2013, the Scripps Institution of Oceanography measured an average of 395.10 ppm CO2 concentration at their Mauna Loa, Hawai’i Observatory. This value is important because 395.10 ppm is the largest CO2 concentration value for any December in recorded history. This year’s December value is approximately 2 ppm higher than December 2012′s. Month-to-month differences typically range between 1 and 2 ppm. This particular year-to-year jump is just outside of that range, but is smaller than some other recent months. For example, February 2012’s year-over-year change was +3.37 ppm and May 2012’s change was +3.02 ppm. Of course, the unending long-term trend toward higher concentrations with time, no matter the month or specific year-over-year value, as seen in the graphs below, is more significant. Figure 1 – Monthly CO2 concentration values (red) from 2009 through 2014 (NOAA). Monthly CO2 concentration values with seasonal cycle removed (black). Note the yearly minimum observation occurred three months ago (red curve) and the yearly maximum value occurred seven months ago. CO2 concentrations will increase through May 2014, as they do every year, before falling again towards this year’s minimum value. Figure 2 – 50 year time series of CO2 concentrations at Mauna Loa Observatory (NOAA). The red curve represents the seasonal cycle based on monthly average values. The black curve represents the data with the seasonal cycle removed to show the long-term trend (as in Figure 1). This graph shows the relatively recent and ongoing increase in CO2 concentrations. The big deal is, as a greenhouse gas, CO2 increases the radiative forcing toward the Earth, which over time increases the amount of energy in our climate system as heat. This excess and increasing heat has to go somewhere or do something within the climate system because the Earth can only emit so much long wave radiation every year. Additional figures below show where most of the heat has gone recently. Figure 3 – Historical CO2 concentrations from ice core proxies (blue and green curves) and direct observations made at Mauna Loa, Hawai’i (red curve). Figure 4 – Historical record of CO2 concentrations from ice core proxy data (red), 2008 observed CO2 concentration value (blue circle), and 2 potential future concentration values resulting from lower (green circle) and higher (yellow circle) emissions scenarios used in the IPCC’s AR4. Note that this graph includes values from the past 800,000 years, 2008 observed values (10ppm less than this year’s average value will be) as well as the projected concentrations for 2100 derived from a lower emissions and higher emissions scenarios used by the 2007 IPCC Fourth Assessment report. It is clear that our planet’s climate existed within a range of CO2 concentrations between 200 and 300 ppm over the past 800,000 years. Indeed, you would have go back millions of years into the geologic history of the planet to find the last time CO2 concentrations were near 400 ppm. And let me be clear, the global climate then was much different from today: the globe was much warmer, there were no polar ice caps, and ecosystems were radically different from today’s. That’s not to say today’s climate is “better” or “worse” than a paleoclimate. It is to say that today’s ecosystems do not exist in the climate humans are forcing on the planet. During September 2013, the Scripps Institution of Oceanography measured an average of 393.31 ppm CO2 concentration at their Mauna Loa, Hawai’i Observatory. This value is important because 393.31 ppm is the largest CO2 concentration value for any September in recorded history. This year’s September value is 2.17 ppm higher than September 2012′s. Month-to-month differences typically range between 1 and 2 ppm. This particular year-to-year jump is just outside of that range. This year-to-year change is smaller than some other months this year. For example, February’s year-over-year change was +3.37 ppm and May’s change was +3.02 ppm. Of course, the unending trend toward higher concentrations with time, no matter the month or specific year-over-year value, as seen in the graphs below, is more significant. The yearly maximum monthly value normally occurs during May. This year was no different: the 399.89ppm mean concentration in May 2013 was the highest value reported this year and, prior to the last six months, in recorded history (neglecting proxy data). I expected May of this year to produce another all-time record value and it clearly did that. May 2013′s value will hold onto first place all-time until February 2014, due to the annual CO2 oscillation that Figure 2 displays. 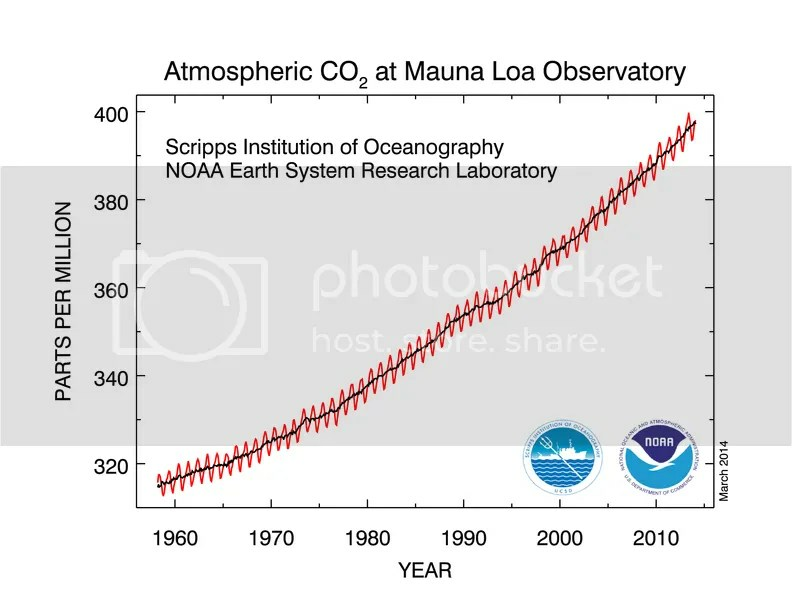 Figure 1 – Time series of CO2 concentrations measured at Scripp’s Mauna Loa Observatory in September from 1958 through 2013. CO2Now.org added the `350s` to the past few month’s graphics. I suppose they’re meant to imply concentrations shattered 350 ppm back in the 1980s. Interestingly, they removed the `400s` from this month’s graph. So concentrations within 5ppm of a threshold are added to CO2now.org’s graphic. How do concentration measurements change in calendar years? Normally, I insert two NOAA graphs here showing 5-year and 50-year raw monthly values and monthly values with the annual trend removed. Unfortunately, due to the government shutdown, NOAA is not updating their graphics. As a side note, I also cannot retrieve NOAA and NASA data for my own research. As a greenhouse gas, CO2 increases the radiative forcing of the Earth, which increases the amount of energy in our climate system as heat. This excess and increasing heat has to go somewhere or do something within the climate system because the Earth can only emit so much long wave radiation every year. Additional figures below show where most of the heat has gone recently. CO2 concentrations are increasing at an increasing rate – not a good trend with respect to minimizing future warming. Natural systems are not equipped to remove CO2 emissions quickly from the atmosphere. Indeed, natural systems will take tens of thousands of years to remove the CO2 we emitted in the course of a couple short centuries. Moreover, human technologies do not yet exist that remove CO2 from any medium (air or water). They are not likely to exist for some time. Therefore, the general CO2 concentration rise in Figure 1 will continue for many years, with effects lasting tens of thousands of years. Clearly, concentrations are significantly higher today than they were for thousands of years in the past. While never completely static, the climate system our species evolved in was relatively stable in this time period. Note that this graph includes values from the past 800,000 years, 2008 observed values (10ppm less than this year’s average value will be) as well as the projected concentrations for 2100 derived from a lower emissions and higher emissions scenarios used by the 2007 IPCC Fourth Assessment report. If our current emissions rate continues unabated, it looks like a tripling of average pre-industrial (prior to 1850) concentrations will be our future reality: 278ppm * 3 = 834ppm. This graph also clearly demonstrates how anomalous today’s CO2 concentration values are in the context of paleoclimate. It further shows how significant projected emission pathways could be when we compare them to the past 800,000 years. It is important to realize that we are currently on the higher emissions pathway (towards 800+ppm; yellow dot). The last time atmospheric CO2 concentrations were that high, the globe was much warmer, there were no polar ice caps, and ecosystems were radically different from today’s. The rise in CO2 concentrations will slow down, stop, and reverse when we decide it will. Doing so depends primarily on the rate at which we emit CO2 into the atmosphere. We can choose 400 ppm or 450 ppm or almost any other target (realistically, 350 ppm seems out of reach within the next couple hundred years). Our concentration target value choice is dependent on the type of policies we decide to implement. It is our current policy to burn fossil fuels because we think doing so is cheap, although current practices are massively inefficient and done without proper market signals. We will widely deploy clean sources of energy when they are cheap; we control that timing. We will remove CO2 from the atmosphere if we have cheap and effective technologies and mechanisms to do so, which we also control to some degree. These future trends depend on today’s innovation and investment in research, development, and deployment. Today’s carbon markets are not the correct mechanism, as they are aptly demonstrating. But the bottom line remains: We will limit future warming and climate effects when we choose to do so. Categories: global warming, NOAA, policy, science | Tags: 350ppm, 390ppm, 400ppm, carbon emissions, climate policy, CO2 concentrations, emissions targets, Mauna Loa Observatory, public policy, Scripps | Permalink. During August 2013, the Scripps Institution of Oceanography measured an average of 395.15 ppm CO2 concentration at their Mauna Loa, Hawai’i Observatory. This value is important because 395.15 ppm is the largest CO2 concentration value for any August in recorded history. This year’s July value is 2.74 ppm higher than August 2012′s! Month-to-month differences typically range between 1 and 2 ppm. This particular year-to-year jump is clearly well outside of that range. This change is in line with other months this year: February’s year-over-year change was +3.37 ppm and May’s change was +3.02 ppm. Of course, the unending trend toward higher concentrations with time, no matter the month or specific year-over-year value, as seen in the graphs below, is more significant. Figure 1 – Time series of CO2 concentrations measured at Scripp’s Mauna Loa Observatory in August from 1958 through 2013. CO2Now.org added the `350s` and `400s` to the past few month’s graphics. I suppose they’re meant to imply concentrations shattered 350 ppm back in the 1980s and are pushing up against 400 ppm now in the 2010s. I’m not sure that they add much value to this graph, but perhaps they make an impact on most people’s perception of milestones within the trend. How do concentration measurements change in calendar years? The following two graphs demonstrate this. Figure 2 – Monthly CO2 concentration values (red) from 2009 through 2013 (NOAA). Monthly CO2 concentration values with seasonal cycle removed (black). Note the yearly minimum observation occurred ten months ago and the yearly maximum value occurred three months ago. CO2 concentrations will decrease through October 2013, as they do every year after May, before rebounding towards next year’s maximum value. The red points and line demonstrate the annual CO2 oscillation that exists on top of the year-over-year increase, which the black dots and line represents. As a greenhouse gas, CO2 increases the radiative forcing of the Earth, which increases the amount of energy in our climate system as heat. This excess and increasing heat has to go somewhere or do something within the climate system because the Earth can only emit so much longwave radiation every year. Additional figures below show where most of the heat has gone. CO2 concentrations are increasing at an increasing rate – not a good trend with respect to minimizing future warming. Natural systems are not equipped to remove CO2 emissions quickly from the atmosphere. Indeed, natural systems will take tens of thousands of years to remove the CO2 we emitted in the course of a couple short centuries. Human technologies do not yet exist that remove CO2 from any medium (air or water). They are not likely to exist for some time. Therefore, the general CO2 concentration rise in Figures 2 and 3 will continue for many years. Figure 5 – Historical record of CO2 concentrations from ice core proxy data, 2008 observed CO2 concentration value, and 2 potential future concentration values resulting from lower and higher emissions scenarios used in the IPCC’s AR4. Note that this graph includes values from the past 800,000 years, 2008 observed values (10ppm less than this year’s average value will be) as well as the projected concentrations for 2100 derived from a lower emissions and higher emissions scenarios used by the 2007 IPCC Fourth Assessment report. If our current emissions rate continues unabated, it looks like a tripling of average pre-industrial (prior to 1850) concentrations will be our future reality: 278 * 3 = 834. This graph also clearly demonstrates how anomalous today’s CO2 concentration values are in the context of paleoclimate. It further shows how significant projected emission pathways could be when we compare them to the past 800,000 years. It is important to realize that we are currently on the higher emissions pathway (towards 800+ppm; yellow dot). The rise in CO2 concentrations will slow down, stop, and reverse when we decide it will. It depends primarily on the rate at which we emit CO2 into the atmosphere. We can choose 400 ppm or 450 ppm or almost any other target (realistically, 350 ppm seems out of reach within the next couple hundred years). That choice is dependent on the type of policies we decide to implement. It is our current policy to burn fossil fuels because we think doing so is cheap, although current practices are massively inefficient and done without proper market signals. We will widely deploy clean sources of energy when they are cheap; we control that timing. We will remove CO2 from the atmosphere if we have cheap and effective technologies and mechanisms to do so, which we also control to some degree. These future trends depend on today’s innovation and investment in research, development, and deployment. Today’s carbon markets are not the correct mechanism, as they are aptly demonstrating. But the bottom line remains: We will limit future warming and climate effects when we choose to do so. Figure 6 – Heat content anomaly from 1950 to 2004 from Murphy et al., 2009 (subs. req’d). 20th century global surface temperature rise measured +0.8°F. That relatively small increase, which is already causing widespread effects today, is a result of the tiny heat content anomaly shown in red in Figure 6. This situation continued since Murphy’s 2009 publication. This figure shows where most of the excess heat went since 2000: the deep ocean (>700m depth). The heat content change of the upper 300m increased by 5 * 10^22 Joules/year in that time (and most of that in the 2000-2003 time span) while the 300-700m layer’s heat increased by an additional 5 * 10^22 J/y and the >700m ocean’s heat increased by a further 8 * 10^22 J/y. That’s a lot of energy. How much energy is it? In 2008 alone, the oceans absorbed as much energy as 6.6 trillion Americans used in the same year. Since there is only 7 billion people on the planet, the magnitude of this energy surplus is staggering. 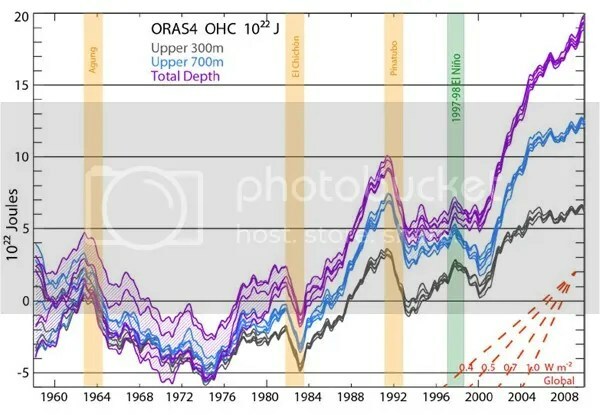 More to the point, deep water heat content continued to surge with time while heat content stabilized in the ocean’s top layers. Surface temperature measurements largely reflect the top layer of the ocean. If heat content doesn’t change with time in those layers, neither will sea surface temperatures. The heat is instead going where we cannot easily measure it. Does that mean “global warming has stopped” as some skeptics recently claimed? No, it means the climate system is transferring the heat where and when it can. If the deep ocean can more easily absorb the heat than other media, then the heat will go there. The deep ocean will not permanently store this heat however. The globe’s oceans turn over on long time scales. The absorbed heat will come back to the surface where it can transfer to the atmosphere, at which point we will be able to easily detect it again. So at some point in the future, perhaps decades or a century from now, a temperature surge could occur. We have been afforded time that many scientists did not think we had to mitigate and adapt to the changing climate. That time is not limitless. Categories: energy, global warming, NOAA, policy, science | Tags: 350ppm, 390ppm, 400ppm, carbon emissions, climate policy, CO2 concentrations, emissions targets, Mauna Loa Observatory, public policy, Scripps | Permalink.